As a social media professional that works a lot with smaller brands, I find myself often trying to show how social media can boast a solid ROI and help with a client’s branding efforts. Little did I know, one of the best case studies that I could use in a room would eventually come from me. As a self-proclaimed up-and-coming young professional and established bachelor, I take pride in being a bit more stylish than the average young gun. My inbox is always full of emails from a variety of modern designers and online retailers that serve me up with gear that you don’t really see around my parts (Midwest). So, when it came time to add some class to my grooming, I narrowed it down to two brands that intrigued me: Harry’s and Dollar Shave Club. Harry’s came on my radar when they were featured in GQ’s fashion issue (isn’t every issue a fashion issue?). I liked the simple design that exuded class. I’ve always been one for the idea that simplicity is a sign of confidence and class. Only the insecure need to adorn themselves with distracting accessories and bling. When I logged onto their site, I liked the tone of their content and the fact that they really seemed to “Give a Shave.” In an Instagram comment thread, they even told me that they loved me. Alas, they were a finalist to become my grooming partner. 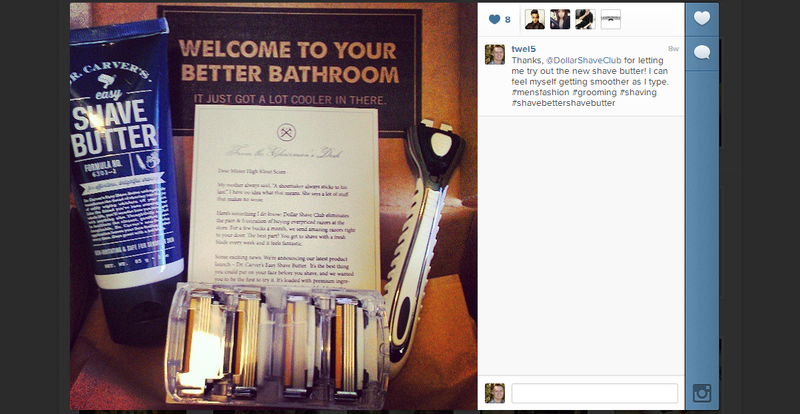 I’ve known about Dollar Shave Club since their historically viral marketing video hit. Obviously, I was immediately captivated by their marketing efforts and loved their comedic tone. I still do. What I didn’t know is that they had such a quality product. I got to try out their razors and new Shave Butter when they targeted me with a Klout Perk. I was pleasantly surprised by how high quality both products were. I had no problems sharing my enthusiasm about their products after getting that perk. With two good brands and quality products staring me in the face, I didn’t know what to do. Being a social guy, I took my question to my friends. In a series of tweets, Instagram pictures and Facebook posts; I outlined that I loved both products. 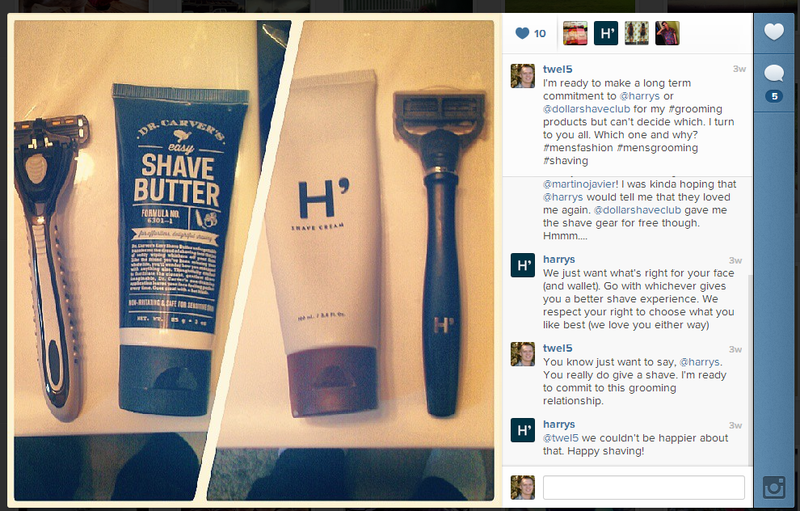 I told my friends/followers that Harry’s told me that they cared about me and Dollar Shave Club gave me free stuff. Sometimes though, I was deliberately vague on which did what. The reviews were mixed. People seemed to be equally placed on both sides of the fence. It all came down to one post. I was running out of blades, my spotty beard was starting to come through and I needed to place an order. I posted a photo on my Instagram account with the two faced off. Whoever won this round would win my business and my loyalty. 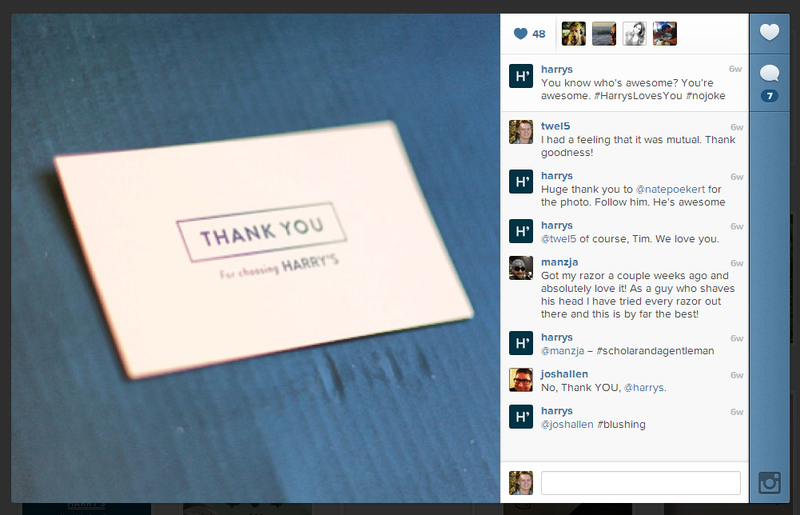 A few hours after my post (see title picture), Harry’s was the first and only brand to respond to my photo. They didn’t hit me with a final sales pitch; they merely stated that they want what was best for me and they’d love me either way. Nailed it. I was happy to make my commitment to Harry’s and eager to let them know about my decision. How big was the impact of a few comments on Instagram? Well, I have 4 months worth of Harry’s blades in my medicine cabinet and I plan on using them for the foreseeable future. I bought my dad The Winston Set and a few months of blades for Father’s Day. I’ve convinced a few of my work friends to convert to Harry’s. I’m writing this article. This entry was posted on June 24, 2013 by Tim W. It was filed under General Marketing, Social Media and was tagged with Community Management, Dollar Shave Club, Harry's, Social Media.